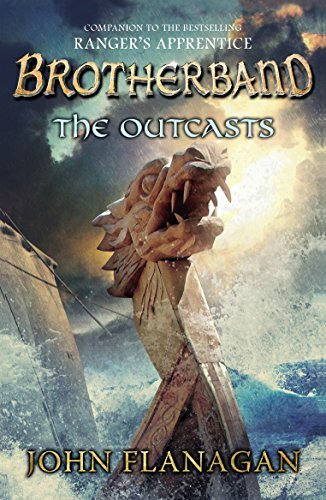 The Outcasts of the title are a small band of young men who have come together to undertake their Brotherhood training. This band is smaller than the other two groups and consists of those young men who were not chosen by the leaders of the Wolves and the Sharks. The Brotherhood training is to fit the young men of the village to fight and protect their community on land and on the sea. Hal, an outcast because of his mixed parentage, becomes the leader of the Herons, named after his revolutionary sailing ship and, as they bond as a team, the young men learn to fight and undertake various physical challenges, sometimes involving some skulduggery. Hal’s mentor is his father’s greatest friend, who was with him when he was killed and has subsequently lost a hand. Thorn turned to drink but mentoring Hal has given him a purpose and in return Hal, who has an inventive turn of mind, makes him a false hand. But the Herons, having won the Brotherhood contest, fail at their greatest test and the story ends with Hal, Thorn and the Herons settling sail in the Heron, his ship, to avenge their humiliation and capture the pirate band who stole the village’s Andomal. The reader will detect the mix of the traditional rites of passage for young men down the ages, and the nod to the Viking and Norse sagas, but this is a fictional world created by John Flanagan, author of the Ranger’s Apprentice series. The Skandia area in which the story is set, the Aurelans of which tribe, Hal’s father was one, and Magyarans are fictional but their roots lie in the Vikings, although the people are more settled; Hal’s mother runs a café for example. The language is modern and the boys eat egg and bacon for breakfast with coffee in mugs, so not quite Vikings! Flanagan’s skill is making this a credible world and most of all showing his readers how a leader emerges. Hal is an outsider because of his mixed parentage, but he knows instinctively how to mould his team together, using all their talents and able too to admit to his own failings. There is the traditional bully in the Sharks, plus a young man, the leader of the Wolves who has a sense of fair play while leading his own team well. There is a stunning drawing of the Heron by John Elliott, many little chapter head drawings and now then an axe in the text and a glossary of nautical terms (but no map which would have been so useful). Boys already hooked on the first series will read this title with relish and eagerly await the next volume, and many girls will enjoy it too.